Q. Neil, if you don’t mind telling us a little about yourself, i.e., where do you live, are you married, what do you do for a living, where you keep you keep your valuables, etc..
A. I’m originally from Suffolk Co., Long Island and moved in 1999 to Cherry Hill NJ, a suburb of Philadelphia PA to accept a promotion to regional sales manager for the yellow page publisher I was working for at the time. The yellow pages were the search engine of the time. I guess you might say I was a pioneer in SEO. In 2012 I started a company with my wife that helps local business owners target market the areas they do business in via direct mail postcards. We’ve helped over 250 local businesses grow. 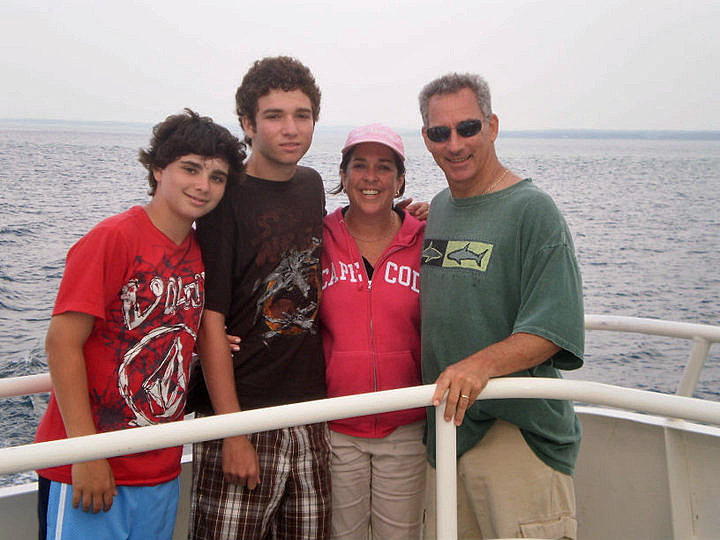 I’ve been married for 31 years and have two grown kids, a dog and cat…. Q.Pretty sure I know the answer to this but does anyone else in the family detect? A. Your assumption is correct. I’m alone in the family when it comes to detecting, and I kind of like the solitude, alone, away from the pressures of home. Not that I always detect alone. It’s nice to have a detecting buddy or two, to share information with, learning or teaching some new tricks and opening new detecting opportunities. Q. 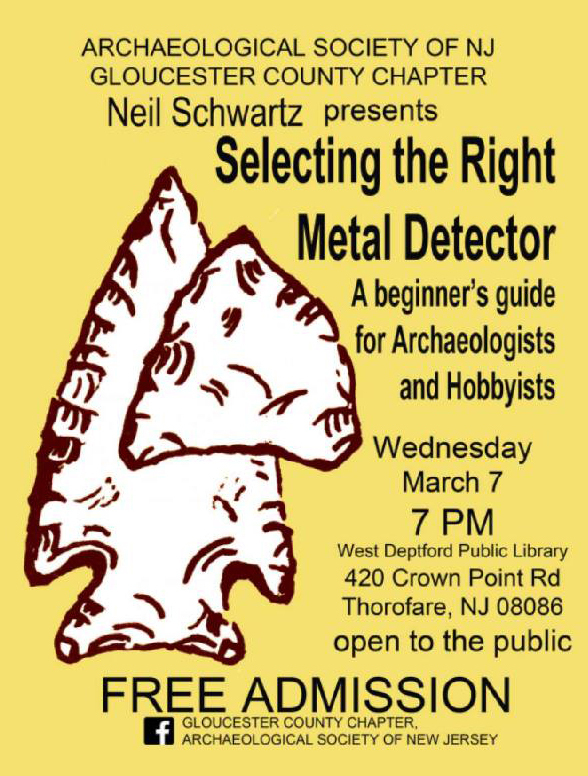 When did you start detecting and what was your very first metal detector? A. For as long as I could remember I dreamed of finding old coins and artifacts with a metal detector but it wasn’t until I was around 40 that I purchased my first one, a White’s PRL1 Industrial detector. It had no display, just a sensitivity and discrimination knob. 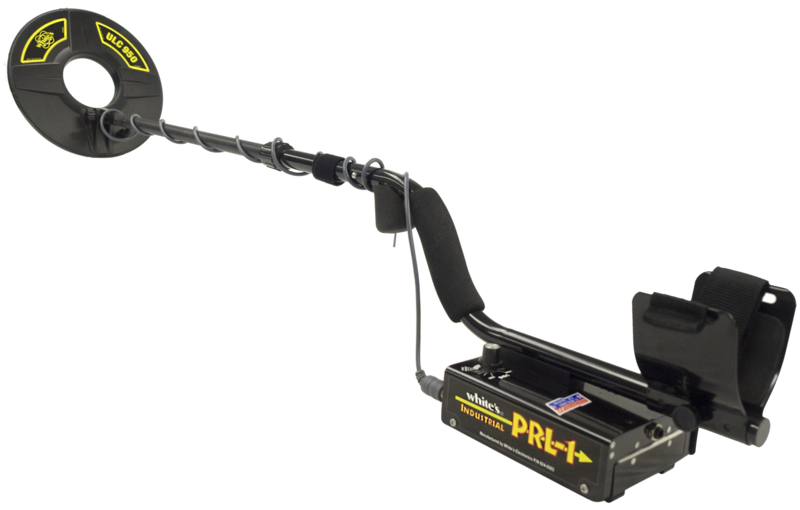 I would compare using this metal detector to learning to drive with only a stick shift. When you learn to drive on a manual transmission, it gives you a better understanding of how the gears work. When you learn on a simple beep and dig detector, you learn to pay more attention to what you’re listening to without the aid of a visual display. Now the detectors do everything but dig the target up. I wouldn’t be surprised if that’s already being worked on by the engineers out in Sweet Home! Q. What was it that made you purchase or use that particular brand/model? A. While servicing one of my accounts, a hobby store in Burlington County NJ, I noticed the display of White’s detectors and started asking questions about it. The owner of the shop explained why the PRL 1 was a good, economical choice. The next thing I knew it was assembled and in my trunk! Q. Neil In the beginning where did you concentrate your time? What areas did you search? A. I immediately went to older parks looking for silver and jewelry. There were some old swimming holes here that went back to the Victorian era, but I think I was hoping to find Indian Head cents. I wasn’t that familiar with coins much older than the late 19th century. Q. What was your very first signal/find? Do you remember? A. I was one of the lucky ones. I recall taking my new detector outside to show the kids, who were in elementary school at the time, turning it on, and almost immediately I got a beep which turned out to be a 1956 quarter! I was ecstatic! Q. And what was your first good or decent find, as in keeper. A. After my beginner’s luck find I went on to find quite a few silver Rosies, quarters, and even a Mercury Dime or two, all on my own property. My house was built in 1963, but my next-door neighbor’s house was a few years older. I bet there were some young boys next door who loved horse-play in the empty lot that was to become my home! Not long after cutting my teeth I dug a nice deep signal about 10 feet from my patio. 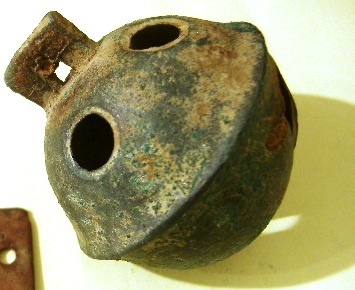 I thought I found a round coaster from the bottom of a sofa, but it turned out to be a crotal bell! I did a little research and discovered that it dated to the mid-19th century. I was hooked! I spent the next several weeks pouring over maps and documents at my public library, trying to figure out what was where my house now stands. Q. Another brain test Neil….how long did it take you to find your first silver coin and do you remember what it was? A. As I said before, the 1956 was the first, but I dug quite a few in those first few weeks and went on to ask my neighbor for permission to detect their yard as well. I would say I’ve dug more than 20 silvers from those two quarter acre lots! I still find an occasional silver at home! Q. 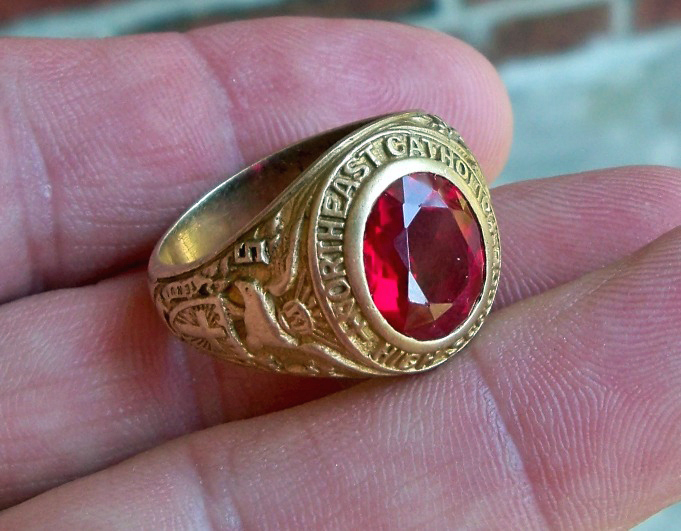 How long did it take you to find your first ring and what type of ring was it? A. I remember digging some silver rings in parks and at schools, but my first gold ring was found several years after I started detecting. It was a 10K signet ring and old based on the look of it. By then I was scouting out colonial sites so it was ironic that I found my first gold ring after I stopped looking for them. Q. Did you spend a lot of time researching in the beginning and if so how did you go about it? A. I spent a lot of time at the library, and nearly every evening looking at old maps and trying to pinpoint sites. The internet was just coming into its own at the time and I soon found myself spending less time at the public library and more time surfing the internet. Q. What would you consider to be your very best find after all this time, and if that’s hard to do tell us about more than one? A. There’s no disputing that my most best find was a rare 1795 Flowing Hair half dime. It’s the great white shark of metal detecting, but I seem to have a knack for finding some of the rarer coins. I’ve found quite a few scarce colonial coins, and one may even be unique, although the monetary value is nowhere near as much as the “h10c”. Q. Okay this one’s off the wall….what is your weirdest find to date? A. This one is a bit tough. I’ve found some unusual things, many are just unidentifiable, but I think the weirdest thing is dentures. I bet there are a lot of beach hunters out there who’ve found a set. Q. What is your “oldest” find to date? A. I’ve found many coins dating back to the 17th century, but my oldest positively identifiable coin is a 1694 William and Mary farthing. Ironically, my mother has me beat with an eyeball find she made while visiting Europe several years ago. She sat down to rest outside an old church in Belgium and found a bronze coin. When she showed it to me I was able to identify it as a 1574 Dutch Oord. Mom’s eyeball find – 574 Dutch Oord. Q. What is your “rarest” find? A. 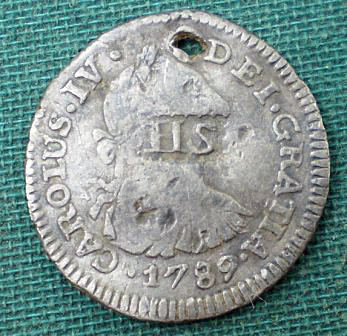 My rarest coin is a Spanish 1789 half reale from the New Guatemala mint. There are a few things that make this coin special. 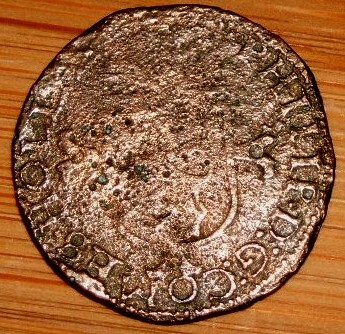 One is the coin was minted after the coronation of King Carolus IV following the death of Carolus III. The coin displays the bust of King Carolus III but has a counterpunched IV over III. It’s listed in Krauss’ Standard Catalog of World Coins, followed only by dashes. As far as I’ve been able to tell, I have the only known existing specimen. Q. Neil what detector are you using at the moment and why? A. I own five metal detectors right now and each one has its strengths and weaknesses. Two of them are beach detectors, one of which one uses Pulse Induction technology. It’s a White’s Dual Field PI. It’s the deepest for the beach, but because it has no discrimination ability, it’s use is limited to clean beaches. 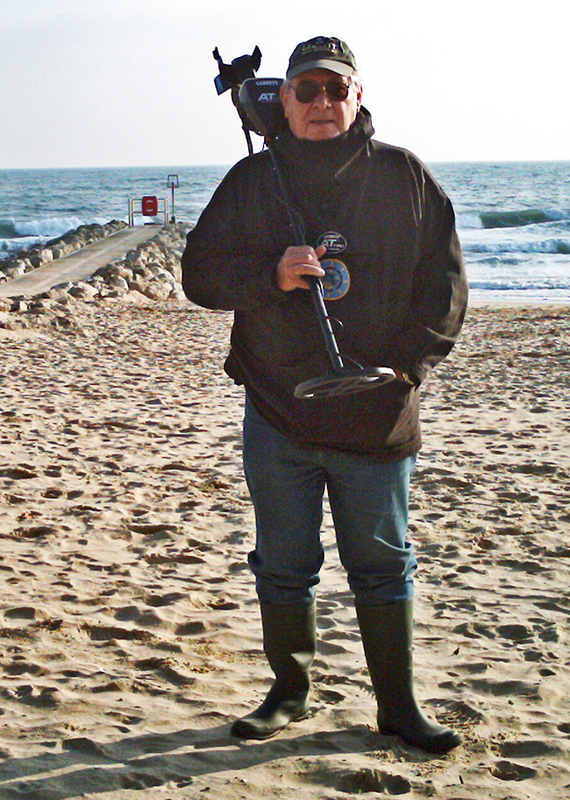 My other is a Minelab Excalibur 1000, which is the best discriminating beach detector in my opinion. The other three are all discriminating VLF detectors which I like for different reasons. My Teknetics T2 is lightweight and deep seeking – but because it’s a single frequency detector, it’s not as good as discriminating out junk targets as other detectors. I have a White’s MX Sport which is a good sport detector, deep seeking, good discrimination capability and it’s dust and waterproof to 10 feet. It’s a great option when there are showers in the forecast. The cream of the crop is probably my White’s V3i which is a feature rich, multi-frequency metal detector. It boasts wireless headphones, and it’s very customizable with literally hundreds of programmable settings. I really like using this at trashy park sites where bottlecaps and other types of trash are an issue. Nobody wants to spend an afternoon digging hundreds of old pop off and twist off aluminum caps. The V3i can analyze the alloys used and let’s you skip over undesirable targets. If I want to look for silver, I can set it to ignore clad dimes and quarters. 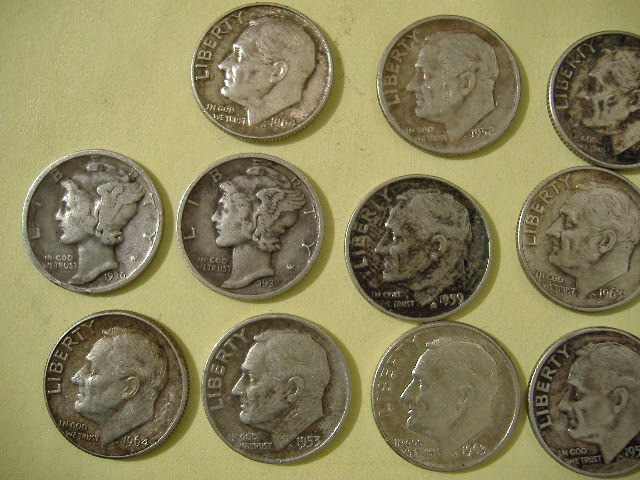 How many detectors do you know that can tell a 1964 dime from a 1965 dime? Q. Can you offer up a few tips or settings? A. I like to run my detectors “hot”. By that I mean that I like to keep the sensitivity turned up to the point where it gets a bit chattery, but for most people I would recommend lowering it down just a bit to keep the detector running smooth. If your detector has a true “all-metal” mode, use it. You’ll get a lot more depth from the all metal channel than from the discriminating channel. I’ll run in all metal mode until I get a good signal, and then I’ll flip it over to the discriminate channel. If it’s iron I ignore it. 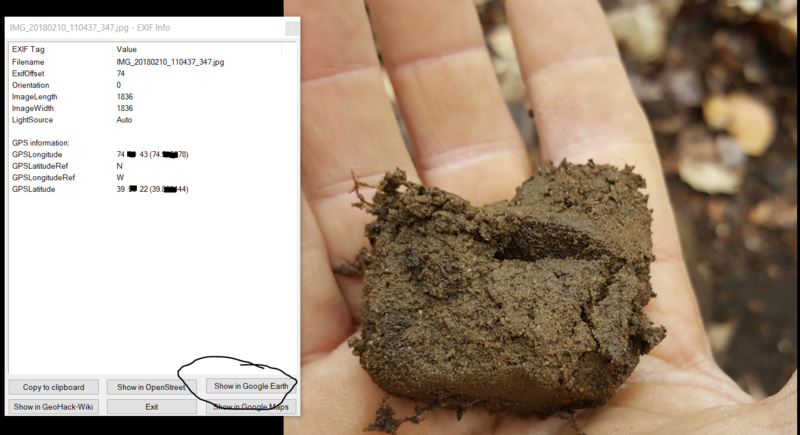 If it’s anything else, I’ll dig it, and if I can’t hear it in the discriminate channel because it’s too deep for the detector to pick up in that mode, I’ll certainly dig it! Q. Where do you spend most of your detecting time now? A. I typically don’t like to travel very far to metal detect. In fact, nearly all my finds are found within an hour’s drive, and many of my best discoveries were uncovered a few miles from my home. I almost never give up on any site, preferring to go back over and over, often spanning over several years. I’ll work small areas sometimes spending several hours in a 5000 square foot area or smaller. My most recent hunts were at a site that I’ve gone to more than 10 times. 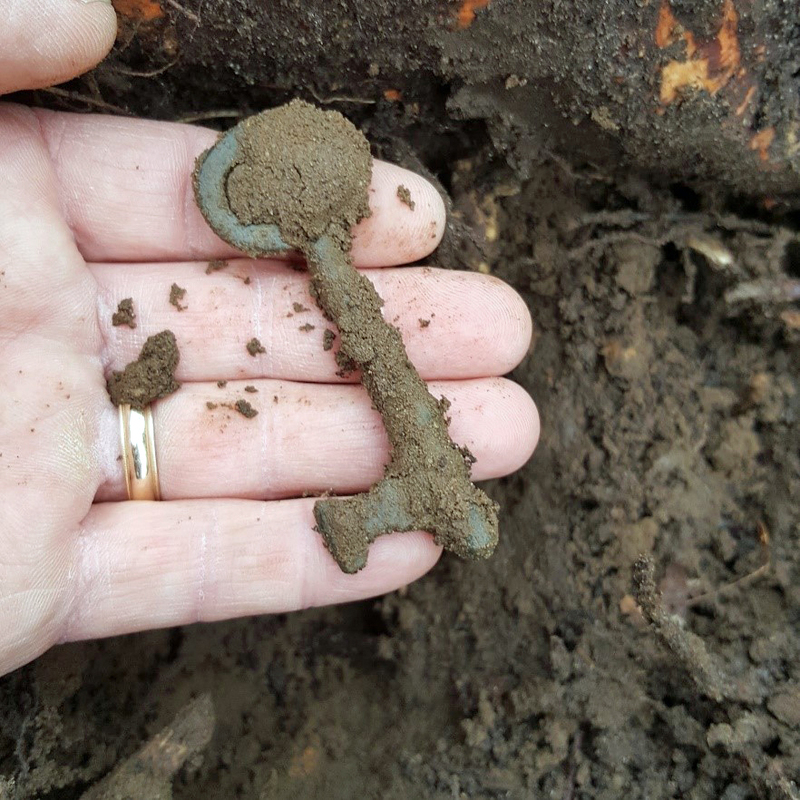 On my last two Sundays my best finds were a 1753 half reale, two large cents, and a large colonial era skeleton key. Q. Do you prefer hunting with others or are you a loner? A. Although I prefer to detect alone, sometimes I like to team up. Some areas are too remote or just a bit too “urban” to detect alone. Other advantages of teaming up is that it can open some new sites, and you can also compare performance of detectors on specific targets. Q. When you do go detecting what accessories do you take with you? A. I always have a large & small digging tool, a Garrett “carrot” pinpointer, a trash pouch, clear plastic coin covers, a good pair of gloves and a cell phone. Q. 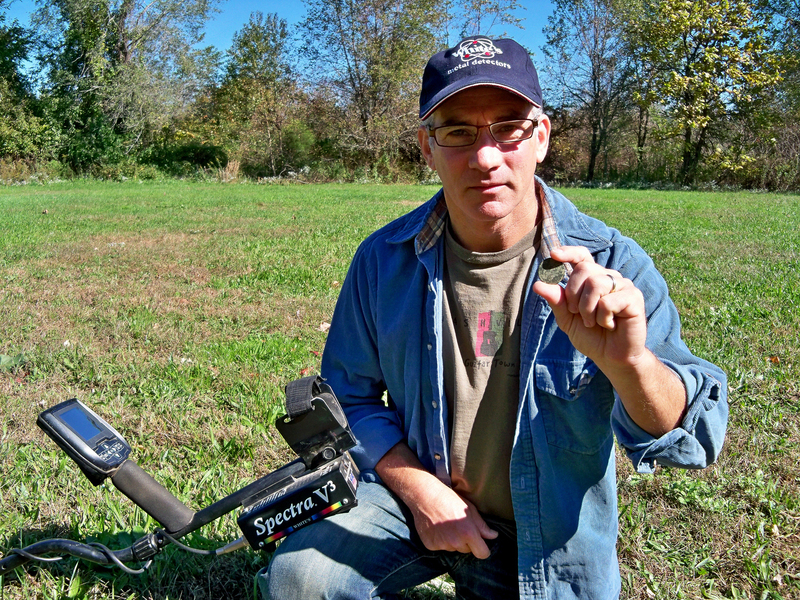 How often do you get out detecting? A. I try to get out at least once on the weekends, from dawn until around noon. The type of site depends on the season. Late fall through spring is reserved for woods, former farm fields, mills and homesteads; late Spring through the fall I spend much of my time at parks, schoolyards and even the beach when possible. Q. Have you detected overseas at all? Q. Neil you surely have a bucket list. Care to share it? A. 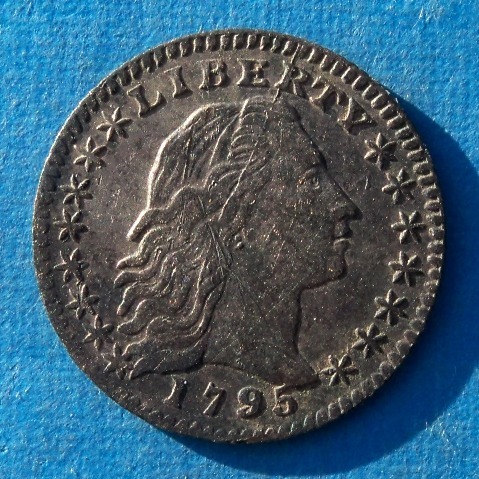 A few things that I would like to find are a gold coin, preferably a colonial, but any US gold would be awesome, a New Jersey St. Patrick copper, and believe it or not, I would love to find one more 1795 Half Dime. Only a few of us have ever found one, but I’ve yet to hear about someone finding two! Q. What would your ideal detector look like? A. 5’11” 120 lbs., blond hair, blue eyes, but I guess that would be a detectorist, not a detector. My real advice is to make the most of the equipment you own. I’ve been down that road where you need to have the best of everything. I owned a detector that was waterproof, had a built-in GPS. I found it to be heavy, and I didn’t need the GPS because I have my location setting activated on my phone’s camera which records the exact location of every one of my discoveries. Q. What advice would you give to someone just starting out? A. Be patient, learn your detectors features by reading the manual over and over again. Practice in your yard with a test garden, and then read the manual again! Q. 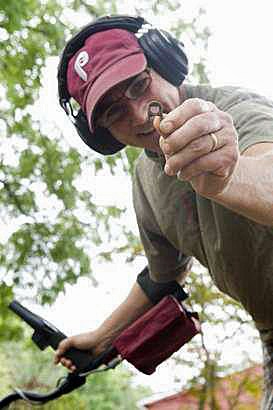 If you could pass along one or two words of advice to other detectorists, what would they be? A. Whether you want to be a beach hunter, a gold prospector or a Civil War relic hunter, the words of advice are the same. Set goals for yourself and then come up with a plan to help you achieve them. Although I don’t belong to any organized metal detecting club, I try to be as involved as possible with the metal detecting community through social media and philanthropic channels. Be sure to check out Neil’s “West Jersey Detecting” site for more of his finds…..
That last paragraph is worth repeating.Great interview as always.Great interview as always. Thank you Frank. Thank you Frank…. Cool finds and interview! I hope he calls me soon! Another great interview. Luuurrrve that half-reale! “Be patient, learn your detectors features by reading the manual over and over again.” Top advice!